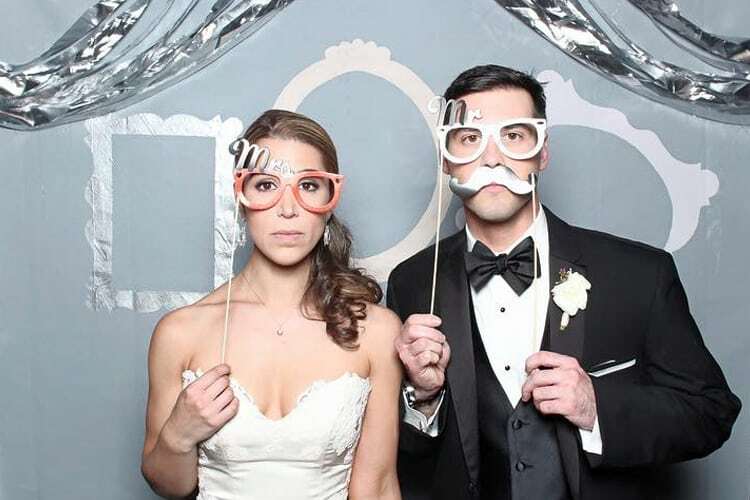 If you’ve decided on black tie as the dress code for your wedding, you’re going to need a tux. Now, we’ve come out in favor of buying over renting before. We still feel that way, but there’s no denying that sometimes renting is the only practical option. 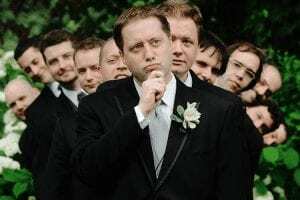 This is especially true if you want your groomsmen to look sharp and neither you nor they have a lot of wiggle room in the budget. If you are looking to rent some awesome looking tuxes, the internet is where it’s at. Here’s a look at the best sites, along with all you need to know about them when navigating the tricky rental market. They offer a solid selection of styles and colors, suitable for a more fashionable, modern wedding. That selection is trimmed down a bit for the “home try-on” option, but if classic is what you’re going for, it’s a good offering over all. You can get any number of different shirts, ties, and shoes to customize your selection and get a true “non-rental” look. The measuring guide is good, but a little basic. They ask for the full-run of measurements, but are relying on you to get it right. Do your research, or, better yet, visit a tailor. These are good things for any man to know. You can rent pre-styled looks, or build your own and max out at $215. Add-ons range from $5 for cufflinks to $35 for shoes. 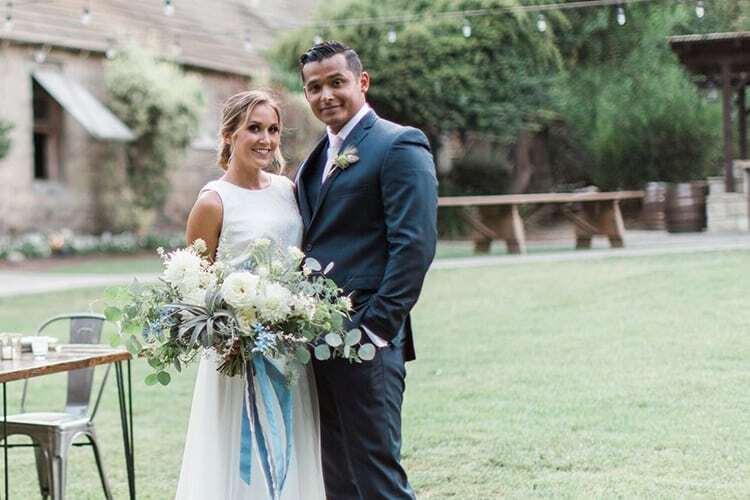 You have the option for a two day home try-on, and can get your rental a full two weeks before your wedding, allowing for time to fix any issues or return for a different size. The fact that they have recently partnered with Nordstrom doesn’t hurt either. Check out their Style Guide for more info. If you’re looking for the classic black tuxedo, you have found your place. Basically any style in black, they have covered. Beyond that, they have a good selection of suits with less dressy add-ons. 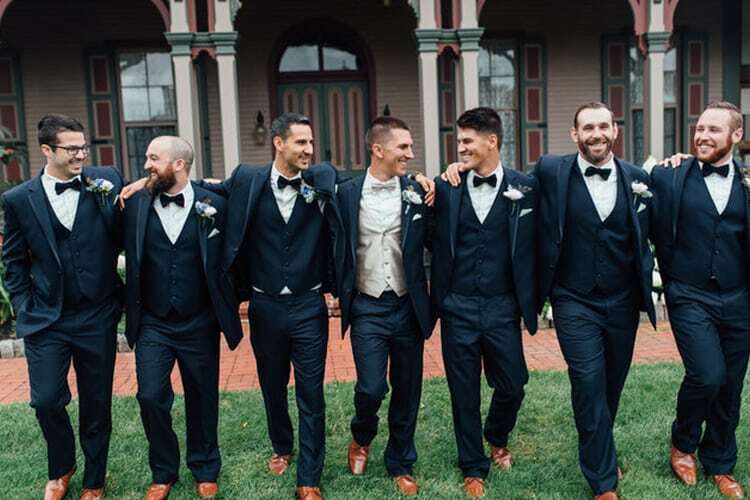 This makes for a good option if all your groomsmen don’t want to drop a new suit, but you want them all to match. The measuring is fairly basic: Nothing too complicated or requiring a tape measure. With all the bells and whistles, this will likely run you just over $200 per person. Gen Tux will try to get it to you a full two weeks prior to the wedding, and they expect you to return it within 3 days following the event. They also offer a two day home try-on service when weddings are more than 60 days away. Scroll through their Style Inspiration if you’re in need of a little, well, inspiration. 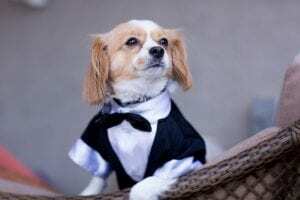 Menguin offers dog tuxedos. DOG TUXEDOS! They also have a good selection of about 20 classic options for humans. Though it includes a good description of the fit and style of each tuxedo, the measuring system they have is merely satisfactory. They balance this lack of input by encouraging you to find a tailor near you, which you can search by zip code on Menguin’s site. Do it. Everything is an add-on, which in this case doesn’t seem to be a bad thing. Tuxedos max out around $119 before any additions. This is a great opportunity for a good set of cufflinks, a pocket square or tuxedo shoes as a groomsmen gift. If you go all-in, you will max out around $250 per person. The suits ship 10-12 days before the wedding, leaving plenty of time to tweak, should you need to. Check out their reviews if you’re still on the fence. These guys seem to have the most options outside of the traditional black tuxedo (though they have plenty of black tuxes as well). Stitch & Tie relies on you to measure yourself, but they offer some easy to follow videos that make the whole process easy. If you are one who follows directions well, this should set you up for success when measuring. 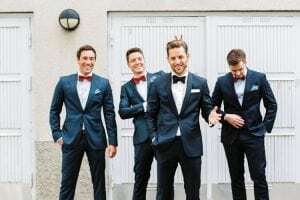 Tuxedos max out around $200 per person, which includes everything from the pre-set look. These pre-set looks are pretty comprehensive, so even if you want to customize your selection, the price should run about the same. Items ship 7 days before the wedding, so there is a decent window for adjustments. Check out their blog for real-life photos from happy couples. Also, for temporary adjustments, they offer up to $15 reimbursements for coat sleeve length and pant length.Not bad: it pays to read the fine print. They have the best selection of brands you recognize, in classic looks you will like: Calvin Klein, Joseph Abboud, and Vera Wang Men. Their measuring is basic, and some of the measurements they consider optional—neck, sleeve length, and jacket size—are not at all optional. If you go with these guys, take the extra five minutes to find the shirt that fits you. Please. They have locations all over the country, which allows for a seamless process when picking up the tux yourself. Tuxedos top off around $230, but just about everything goes on sale, making the most expensive closer to $200. 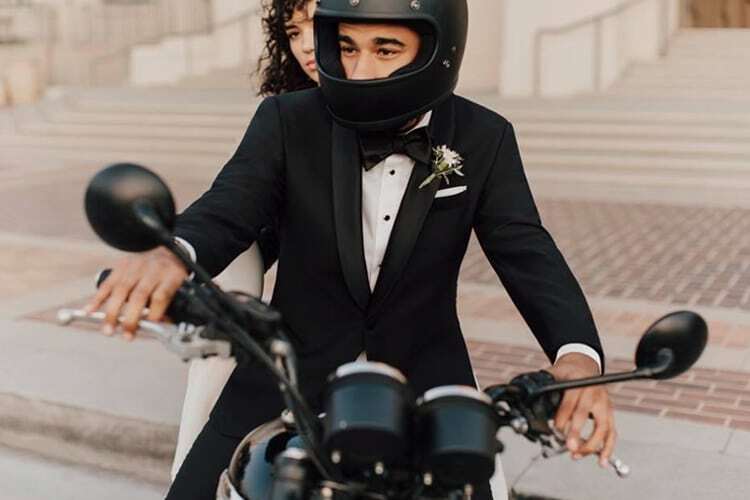 If you rent online, you get the tuxedo a week before the wedding. If you go through the store, it’s ready for pick-up two days ahead. Online is a great option for tuxedo rental, but be sure you get your measurements right before you order.